I put this walk together under the pretence of giving myself a good run out on the fells, the type of walk where limbs would ache & summits often looked just too far to reach, it does the soul good every now & again to remember why I walk within the mist of quite a hectic lifestyle. 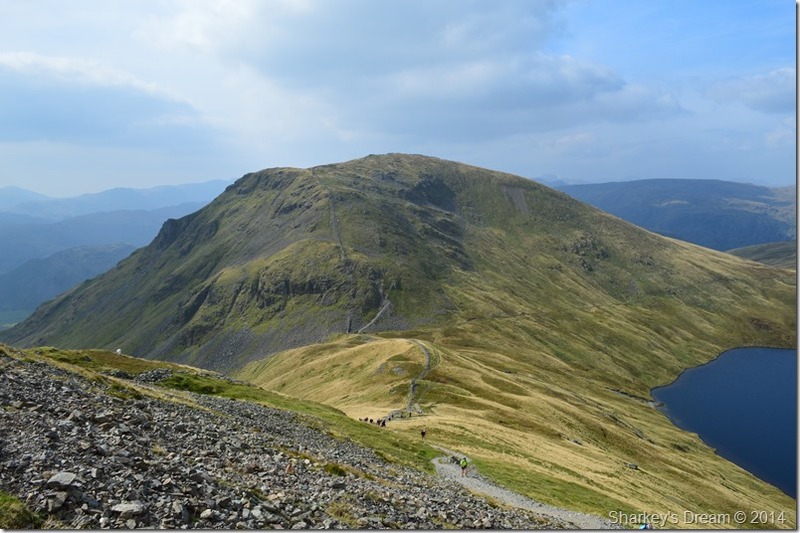 Initially I only had Helvellyn via Striding Edge in mind which of course in itself is a good day spent, however should my plan have gone ahead I would have also explored the mountain from tarn to edge. I think it was during my drive home from work where I often drift from work to walking when I thought about giving my boots a good run out, not to mention the aching limbs, I guess I got my wish & possibly more as I now sit typing this with muscles still aching. 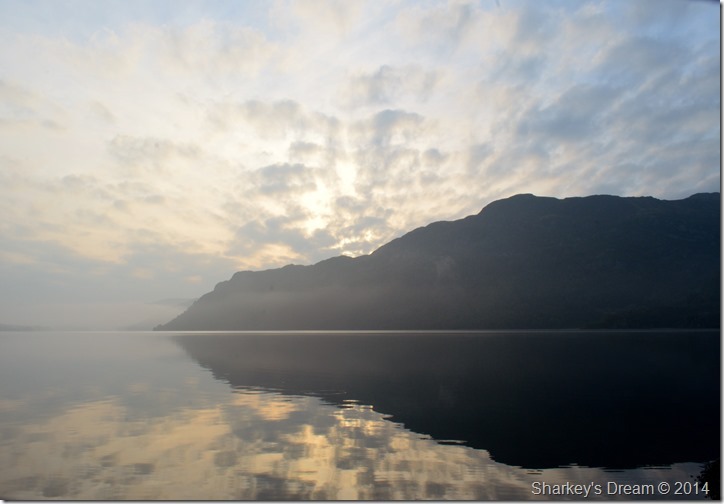 Surely there is no other place in this whole wonderful world quite like Lakeland… no other so charming, no other that calls so insistently across a gulf of distance. All whole truly love Lakeland are exiles when away from it. 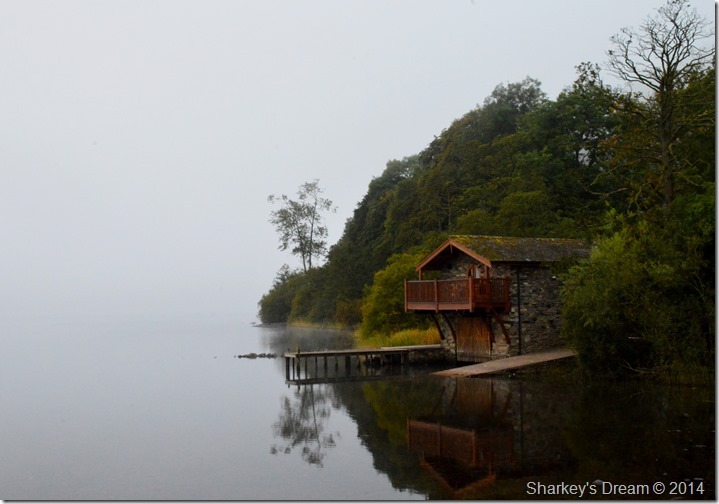 The Duke of Portland Boathouse, Ullswater. I couldn’t resist a cheeky stop off at The Duke of Portland Boathouse as a low mist hovered above the surface creating a mirror finish, the mist was all but dispersing but very atmospheric. 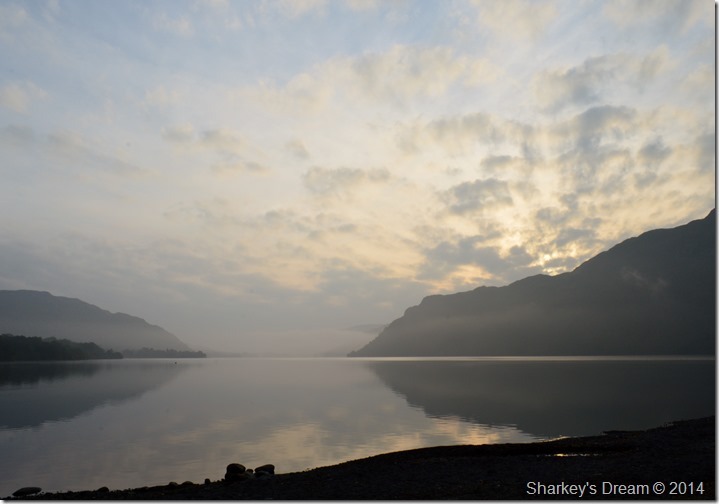 Dawn over Silver Crag, Ullswater. 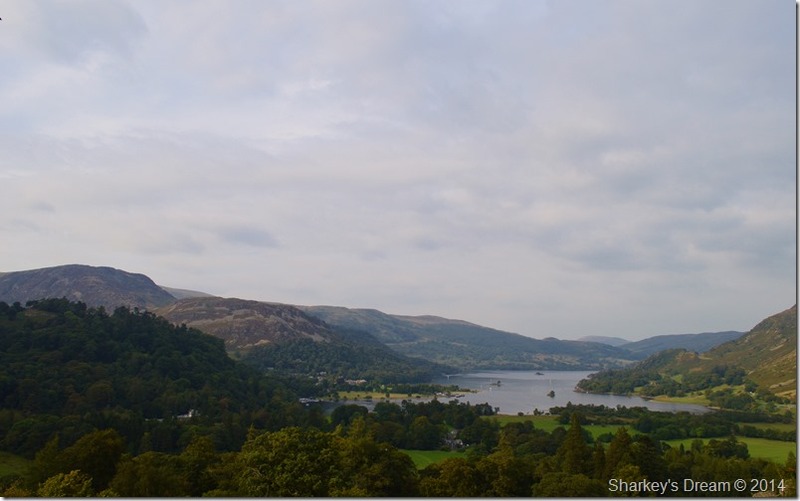 After leaving the Lake Road I soon passed through a busy Glenridding & an even busier Patterdale -this owing to the fact that there was a fell race where most of the competitors were based in Patterdale. I just managed to secure the last parking space opposite the White Lion Hotel. Large groups of competitors were already passing me as I booted up behind the car distinguished by numbers on the back of their packs. It was here I wondered what their route would be, as it turned out, it was very similar to mine. With the car locked I threw my pack over my shoulder & tried to gain some ground on the large groups by picking up the track behind the Village Store which sadly for me, didn’t work. I found myself repeating once more that I wasn’t part of the group which was rather embarrassing for the both of us as my voice started to get deeper. The second part of the group was ahead so I quickly started to catch them up too, my ankles bearing the pain of my quick stance so early after leaving the car, as I gained on them a girl span around with a camera as if to take my photo, thankfully she instantly realised that I wasn’t part of the group before quickly apologising, it’s ok I reply. ‘Let me guess’ your from Settle or somewhere close aren’t you? erh no I’m from Wigan, oh she replied you really sound like your from Yorkshire, my sisters from Settle & you really have the same lingo. No I smirked, definitely Wigan. Despite her lingo guessing game the young girl was really nice & friendly as we picked up conversation on our routes, it was here I learned just how similar they would be. My heart sank a little with the news that I would be sharing my walk today with…wait for it. 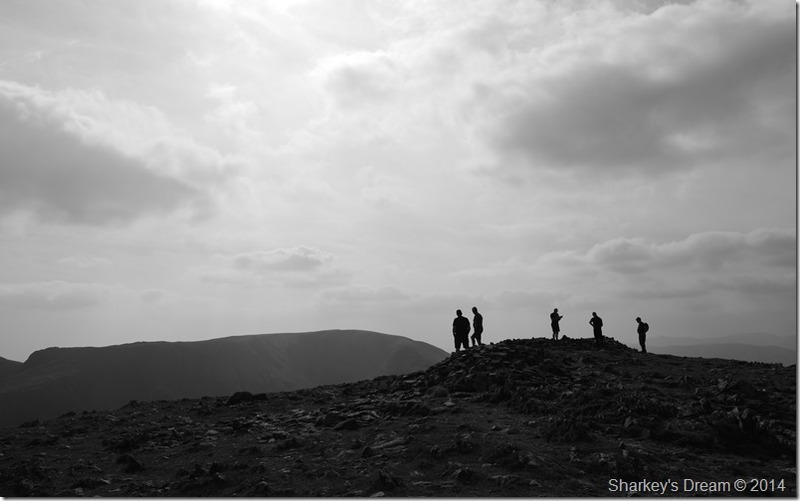 Nineteen teams of endurance walkers. 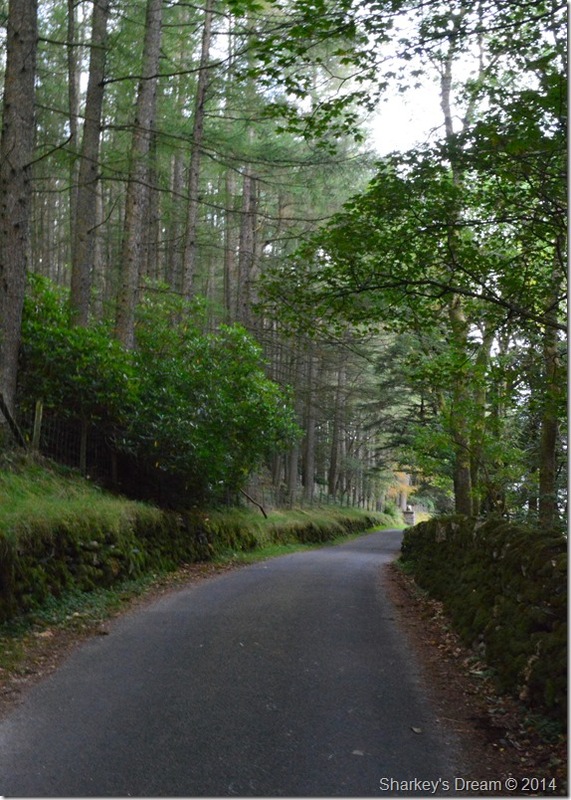 I split off from the track & descended onto the tarmac lane seen in the photo, again trying to gain as much ground as I could, thankfully however, our routes were differed after crossing Kennels Bridge where I picked up the path for Hole-in-the Wall. Angels torches over Lower Grisedale. After crossing Kennels Bridge I picked up the steep grassy path towards a stone wall, again I was on the tail end of yet another large group, their voices loud enough to set the dogs barking below at the Kennels, the whoop whoop’s certainly didn’t help matters, had I caught up with the group my voice would have been known. 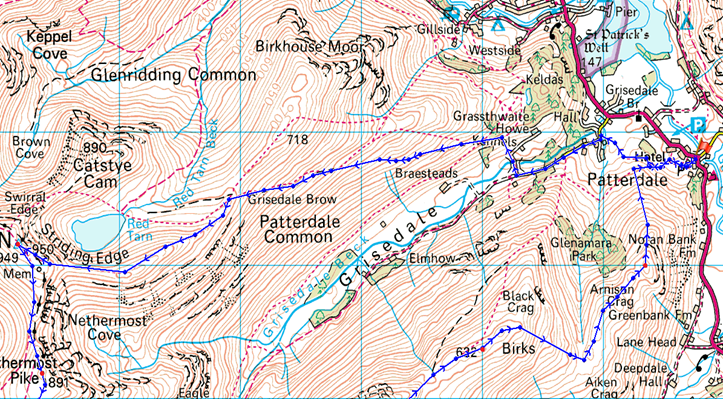 This is where their route differed from mine as strange as it may seem they headed right towards Lanty’s Tarn from which I can only guess they would then pick up the path for Birkhouse Moor. I had my wish as by now I had the whole path to myself at times blessed with very atmospheric views towards Patterdale & the far eastern fells. 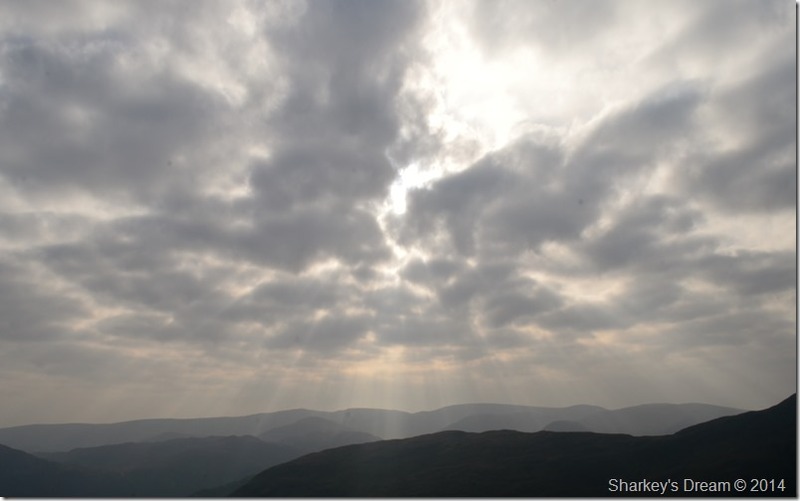 Atmospheric eastern fells as the sun struggles to breach through the cloud. 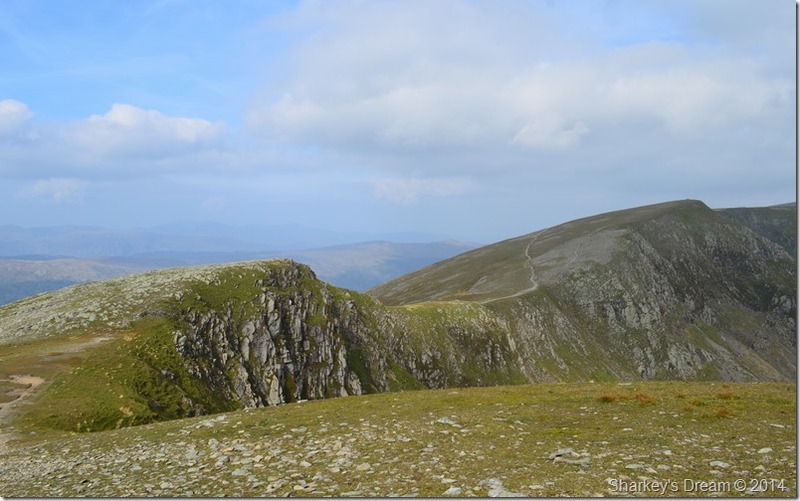 Views over towards St Sunday Crag, Fairfield, Dollywagon Pike & Nethermost Cove. Despite the lingering cloud behind me the humidity was very high & with no wind conditions were extremely muggy to say the least. The early morning haze didn’t look like it was going anywhere soon which kinda laid down any plans for clear shots which will go on to last throughout the whole duration of the day, but today isn’t all about the photos. Further up the path I caught up with two women who were from Dorset heading for Striding Edge, they too complained just how still & muggy the morning was, it wasn’t our last meeting as I met back up with them on Striding Edge a little later on. The terrace like path soon gave way for a stone staircase which lead all the final steep ascent toHole-in-the-Wall. 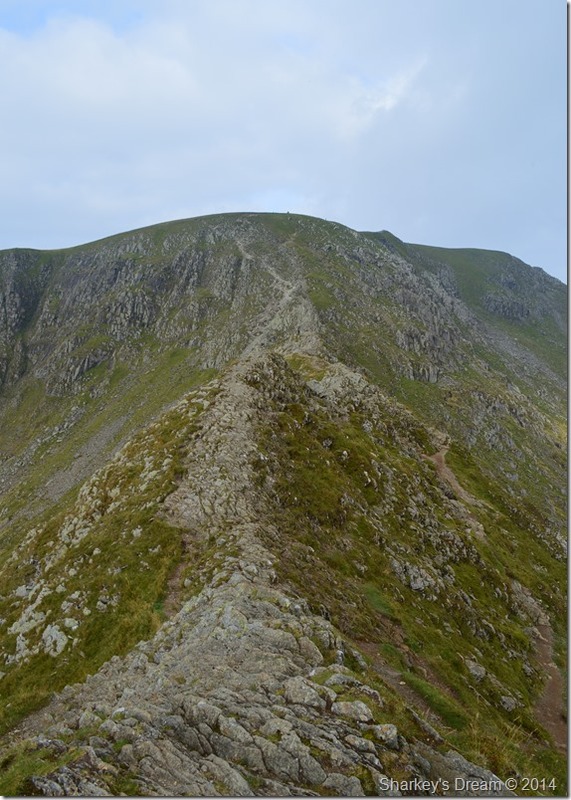 Helvellyn, Striding Edge & Swirral Edge from Whole-in-the-Wall. After crossing the sty at Whole-in-the-Wall Helvellyn opened out before me, it’s a view as I’m sure many would agree is enough to make the hairs on the back of your neck stand on end, adding to this the anticipation of both Striding & Swirral Edge for which ever route you choose, it’s sure to get the heart racing. Ahead, besides the path I notice a tent & what I thought was three wild campers, one of whom was walking a young Collie who barked at me from afar, the walker lead the dog away from the path so as not to bother me, but, I know coming from a family who has owned Collies that this dog was merely saying hello. As I got closer to the tent I instantly recognised one of the men as Mark Richards, the famous outdoor writer who had walked with Wainwright personally, with him it had to be outdoor film maker Terry Abraham who’s fantastic film Life Of A Mountain Scafell Pike was a huge global success for Terry, to shake both these men’s hands left me in a bit of a quiver. Terry Abraham, myself & Mark Richards. Both Terry & Mark were here on Marks new project and were filming aerial shots from a Quadcopter seen in the foreground of the photo. Tony, the guy who was kind enough to take this picture was the operator of the Quadcopter. 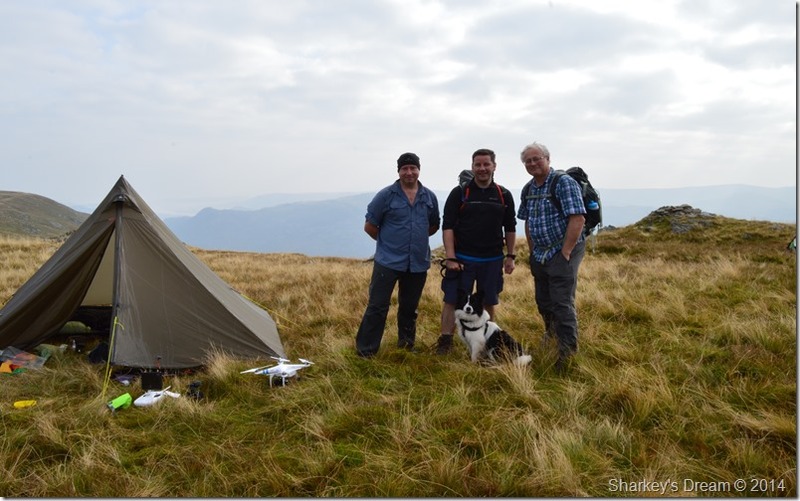 Terry introduced me in detail to the kit they were using to film & how the camera worked beneath the Quadcopter, without wanting to outstay my welcome I bid Terry, Mark & Tony farewell with a firm handshake before heading for High Spying How. 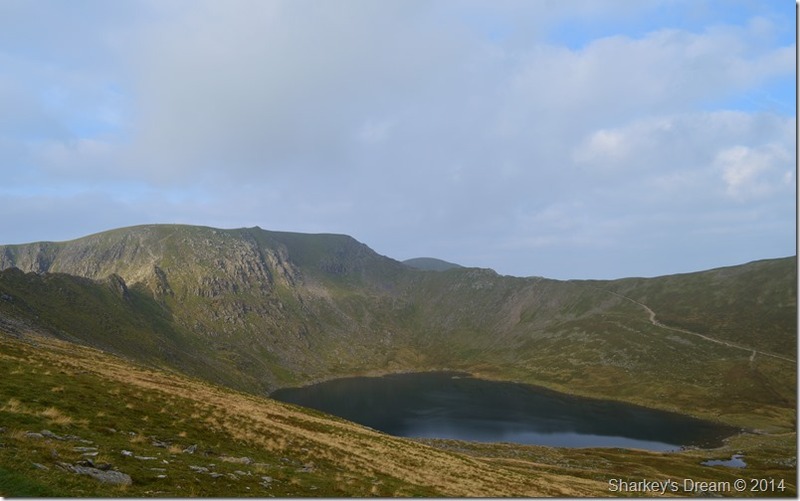 Red Tarn, Helvellyn, Striding Edge & Swirral Edge seen from Low Spying How. 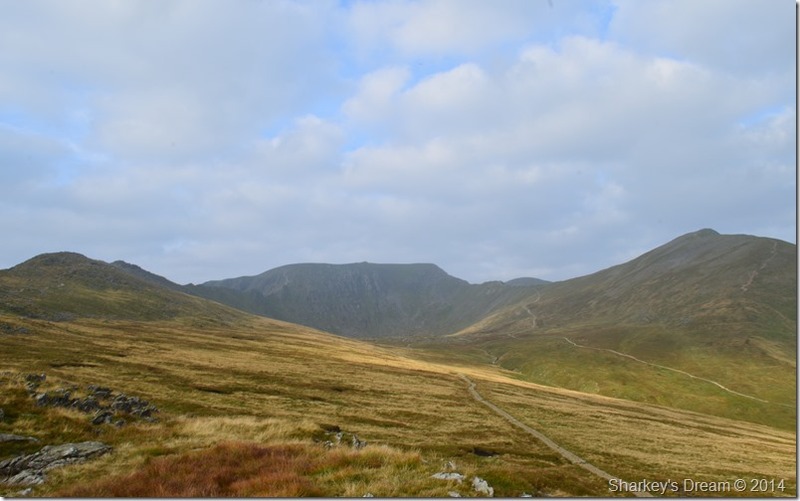 Striding Edge & Helvellyn from Low Spying How. In the time I took to talk to Terry & Mark a number of walkers had now passed me, so too had the two women I met briefly at Hole-in-the-Wall, I soon caught them up again as one asked had I just been talking to friends of mine, when I explained that one was a famous film maker & the other a famous outdoor writer they were quite made up for me which lead them to ask about how I started my fell walking career in the first place. This is the kind of question you ask when you’re tired or sleepy, because this subject is really close to my heart & I will go on a bit! I asked them had they done Striding Edge before & they replied they sort of had only having to turn back as a friend who was with them didn’t have it in them to carry on, the reason for them being here today was to complete what they started to do last year. I gave them a little advice about the various paths with switch over the ridge & also the option to avoid the chimney route if they didn’t feel comfortable with that sort of thing. In times gone by I had mostly used the path that flanks the ridge traverse to the right, it’s only up until recently have I gained the confidence to use the ‘over the top route’ I still get that leg ‘wobble’ especially when I’m holding a camera up to my eye as doubt overcomes balance momentarily. IN MEMORY OF ROBERT DIXON OF ROOKINGS PATTERDALE WHO WAS KILLED ON THIS PLACE ON THE 27 DAY OF NOV 1858 WHEN FOLLOWING THE PATTERDALE FOXHOUNDS. 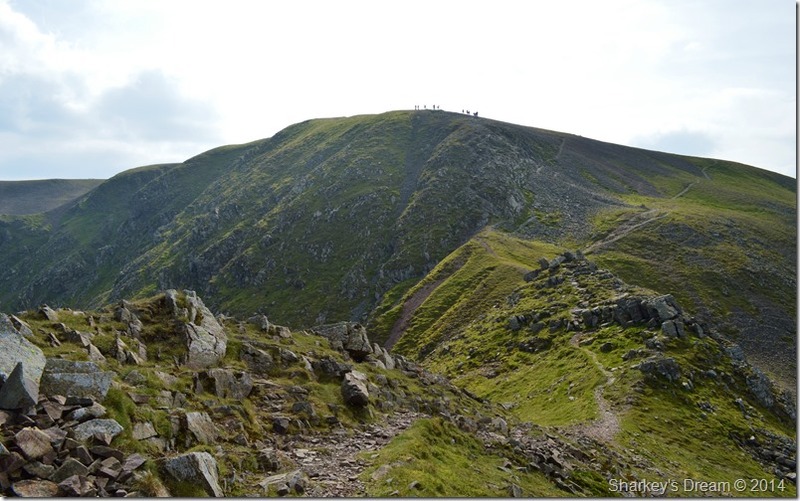 Helvellyn & Striding Edge from High Spying How. 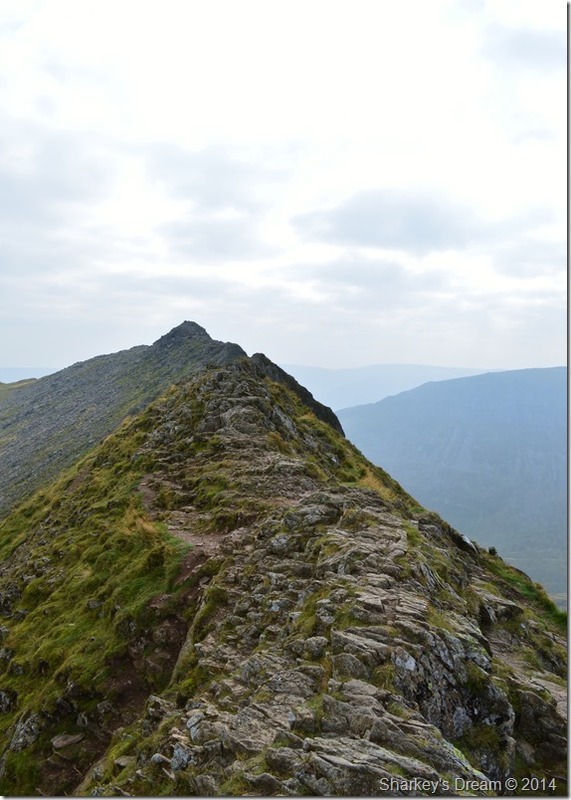 The Chimney (foreground) Striding Edge & High Spying How. Descending The Chimney can be a little tricky which is why I always flank it via a narrow path which when viewed (from this angle) is to the right of The Chimney, those of you who wish to go over the top can do so & descend down the face of the crag with no more than a steep scramble, for the masochist inside you descend by the left (from this angle) where you are presented with a descent via The Chimney itself, I’ve only descended The Chimney once & it nearly killed me! After the exhilarating traverse next is a steep push up towards the summit, here the path has been eradicated & right now, is under repair. The ascent is loose in places & all hands can be required to propel yourself over the larger boulders, the path(s) are never out of sight. 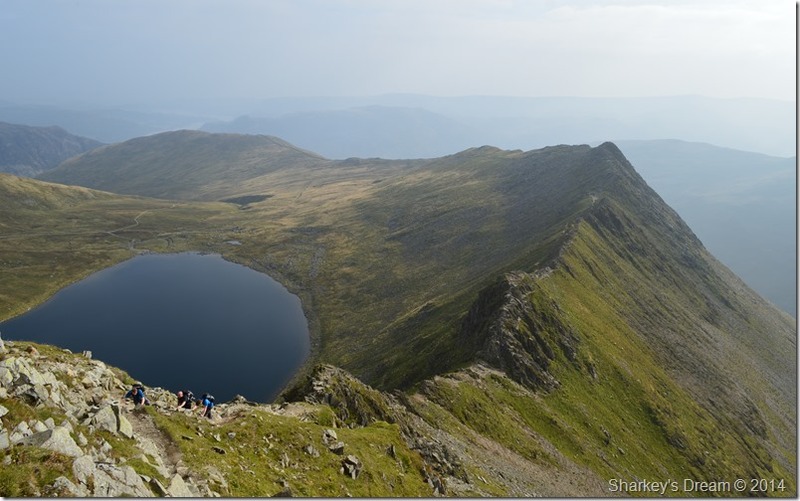 Here, looking down on Striding Edge & Red Tarn taken just below the summit. 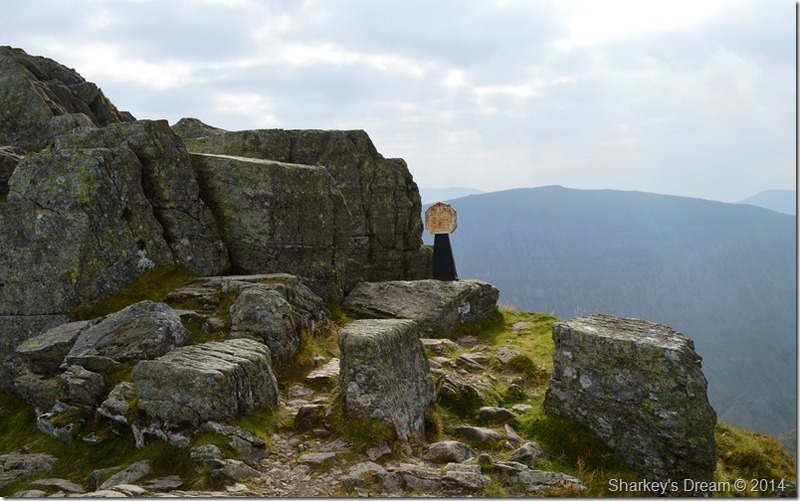 The Gough memorial found at the top of Striding Edge. The final push towards the summit for me is equal to Striding Edge itself as the route can be as diverse as you choose it to be either by following the path or by picking your way over boulder, the path however as already mentioned is under repair & very loose, the dry conditions only adding to this, after an easy scramble I top out at the Charles Gough Memorial before making my way to the summit shelter & cairn. Here, looking much less busy in my photo than it actually was. I have a wander over to the trig point & de-shoulder pack where I take out my walking poles in earnest for my route ahead. 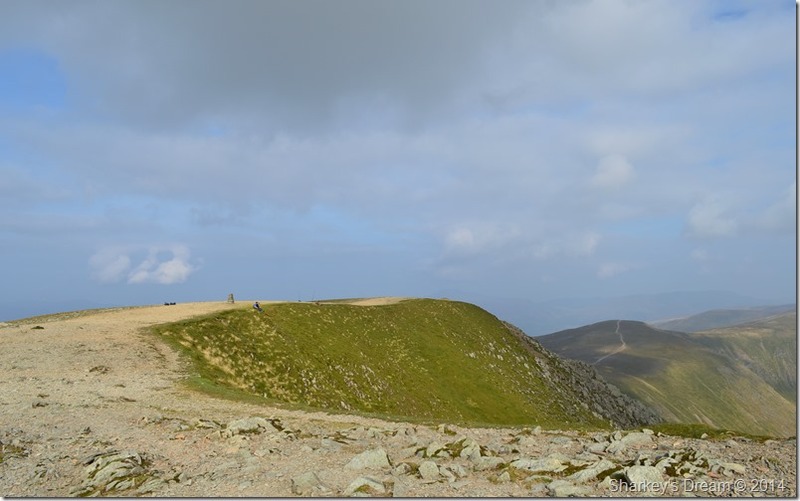 Views from the summit were interrupted by haze which wasn’t good news for any long distant photos, from here Swirral Edge also looks a little gloomy as does Catstye Cam, the pictures that I did take knowingly, didn’t turn out as I wanted them too. With this I turn heel & head back towards the summit shelter which by now is getting busier by the minute as more & more walkers from all directions arrive at the same time, so do a large group of endurance walkers who pass the summit & head for Nethermost Pike, with this I don’t fancy getting caught up walking with them so I give them a healthy lead before I set off, before which, I help myself to a mouth watering Satsuma which after peeling, went down in just two bites. 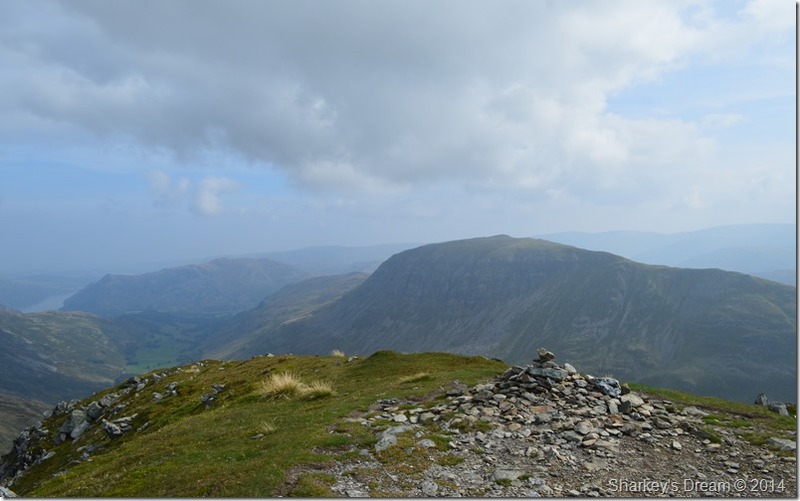 Nethermost Pike & a distant Dollywagon Pike, beyond the haze, Fairfield from the summit shelter. 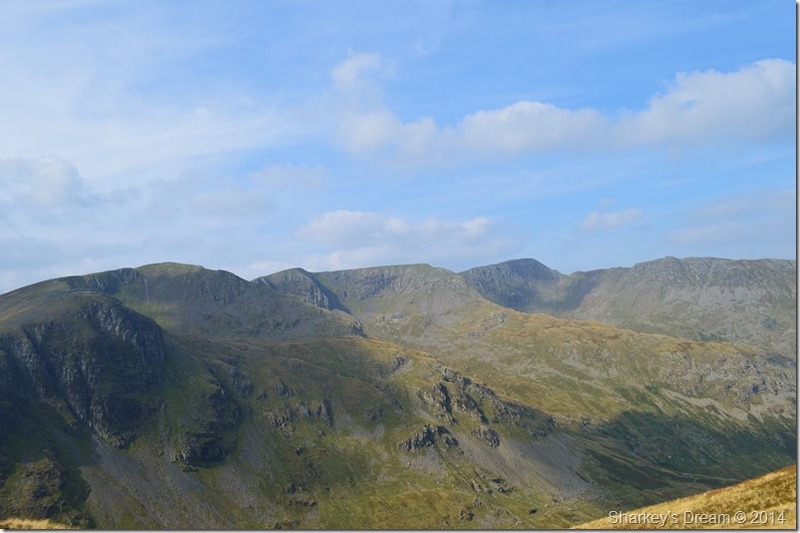 Helvellyn, Catstye Cam & Striding Edge as seen from Nethermost Pike summit. 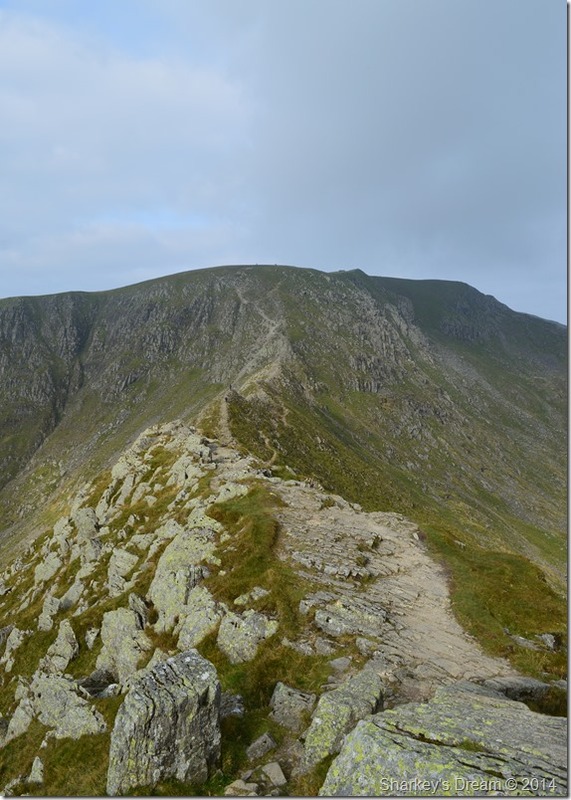 Nethermost Pike was quickly gained once Helvellyn had been left behind, the group who had left before me had long gone which left the summit just to myself & an elderly gent who was approaching from the Birk Side direction. High Crag, Dollywagon Pike & Fairfield seen over Nethermost Cove taken shortly after leaving Nethermost Pike summit. 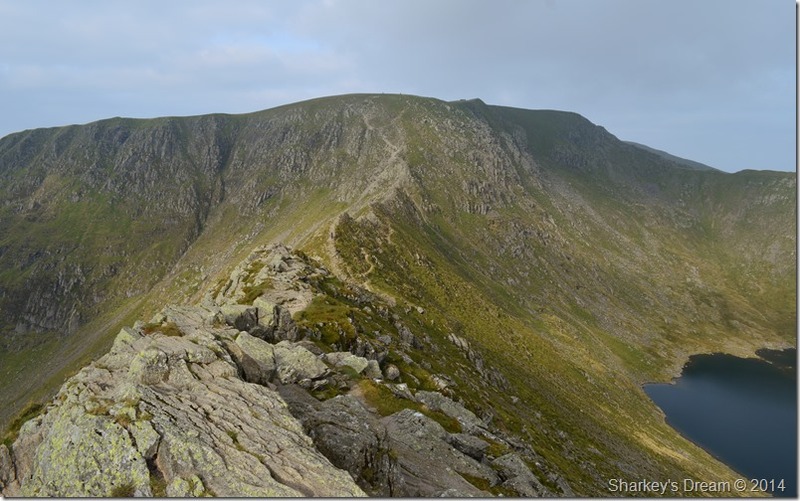 High Crag & Dollywagon Pike over Nethermost Cove. 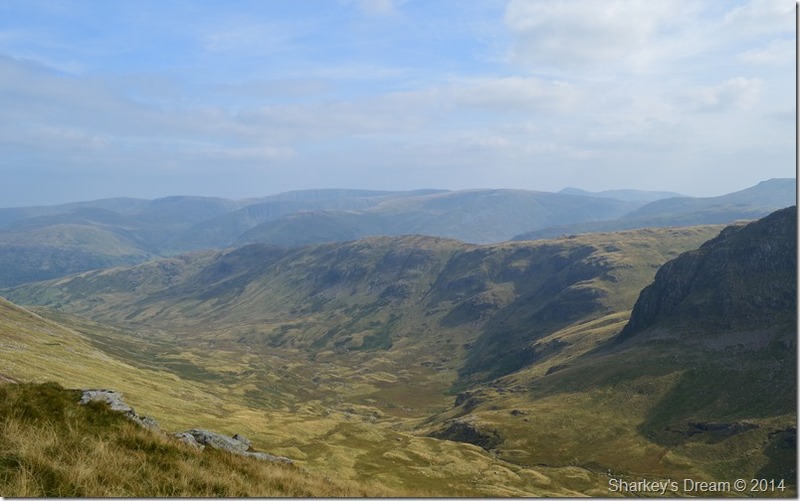 Here, looking back towards High Crag & Nethermost Cove. 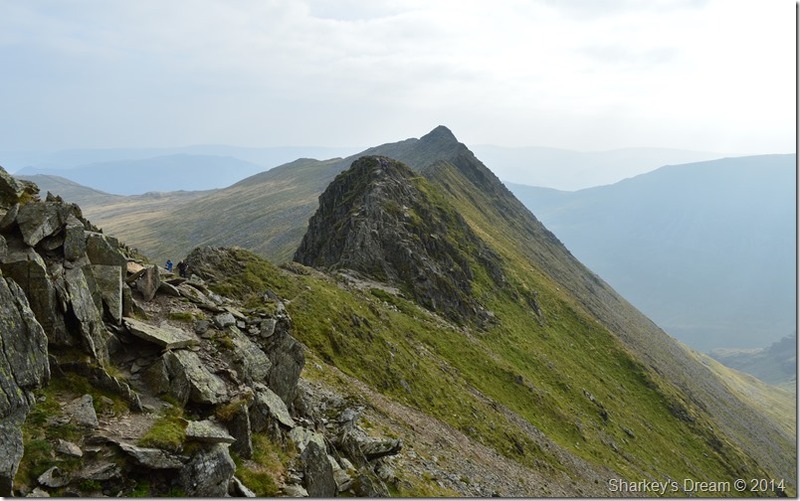 High Crag was quickly gained with hazy views down into Grisedale & St Sunday Crag. 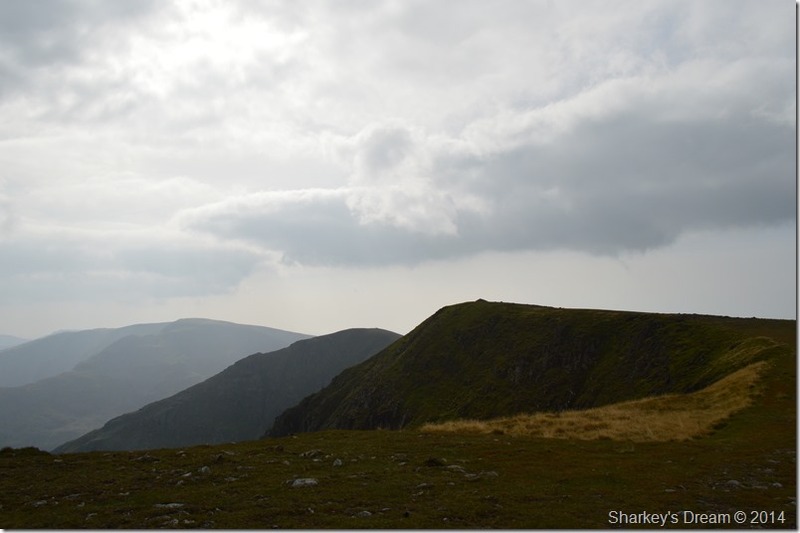 I was now walking with my back towards the Central Fells who through the haze somehow looked to all congeal into one. 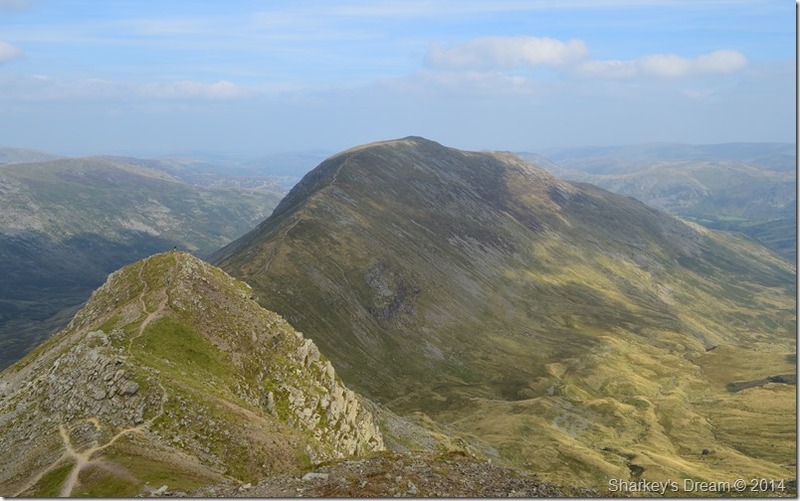 St Sunday Crag, Place Fell & Grisedale seen from Dollywagon Pike summit. 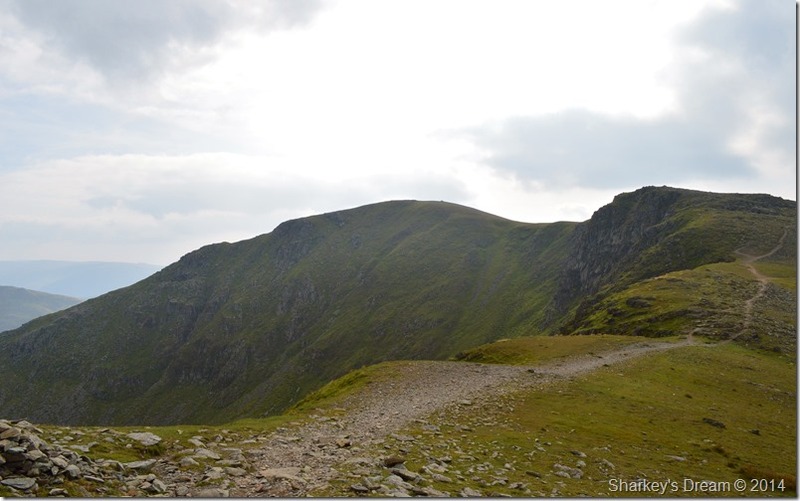 It was mid morning by the time I had reached Dollywagon Pike & hopes were dashed of the haze clearing. Behind me a woman Marshall sat on top of the second summit cairn & we got chatting about the weather (glorious) the haze, not so. She went onto say that this time next week she would be in her final exam to be a Lake District Guide & she hoped for much of the same conditions, she asked me of my own route & she was pretty surprised instead of heading down to Grisedale that I would be ascending Seat Sandal instead, our parting words were I think you’d better get on, you’ve got a long day ahead of you! 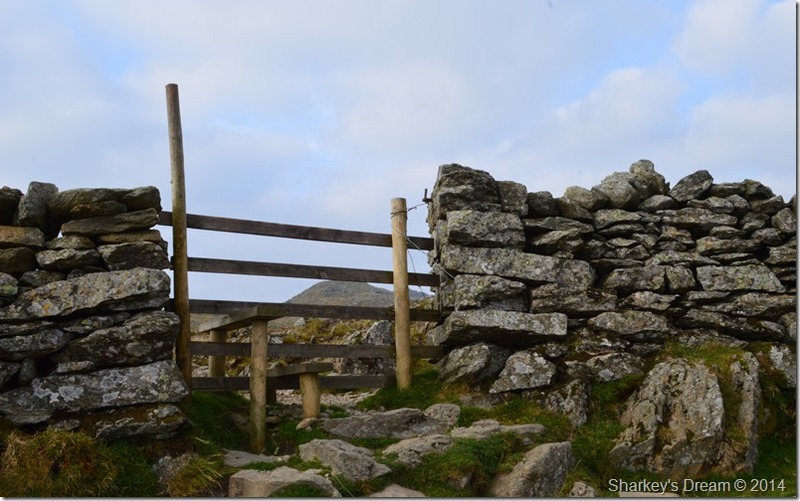 I wished her well for next weeks exam before descending Dollywagon Pike via the old fence on the south west side of the fell. 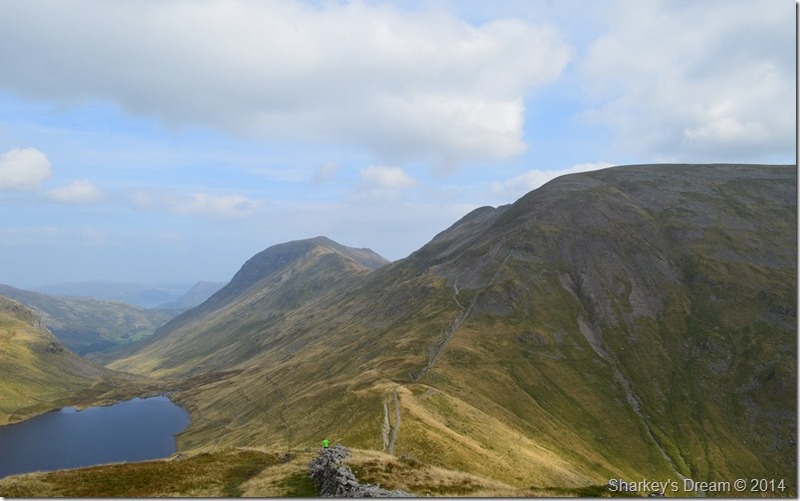 Fairfield, & Great Rigg seen over Grisedale Tarn & Grisedale Hause. 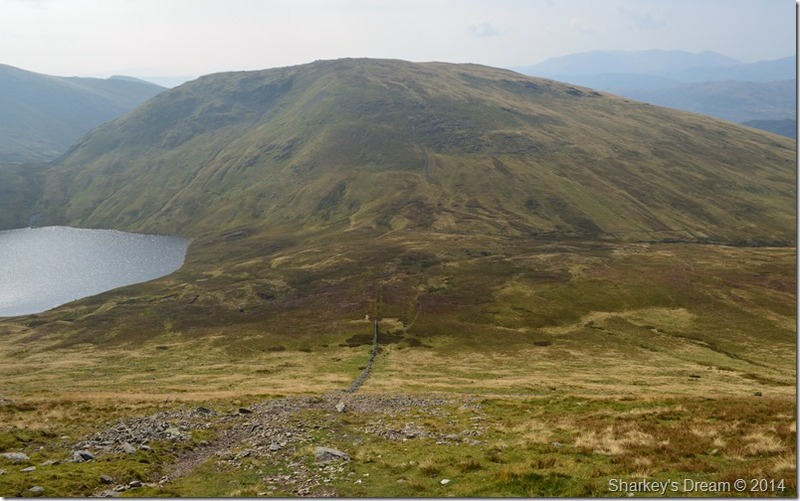 My ascent was steep, steep enough to lose the view as the fell kind of drop away before you, it’s a route I haven’t used before yet going of the path on south east side of the fell I already had an incline on what to expect. I choose to blaze my own descent by zig-zaging my way down which I found much easier than using the path cut with ascent in mind. 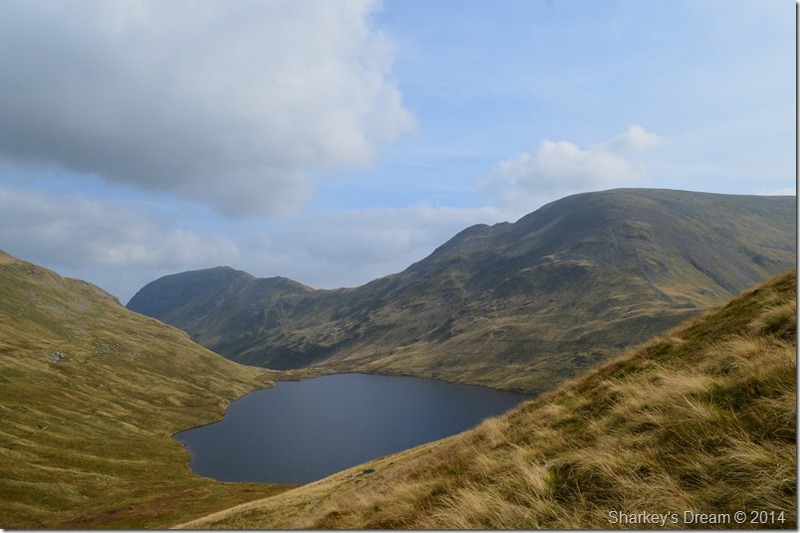 Seat Sandal & Grisedale Tarn from my steep descent from Dollywagon Pike. 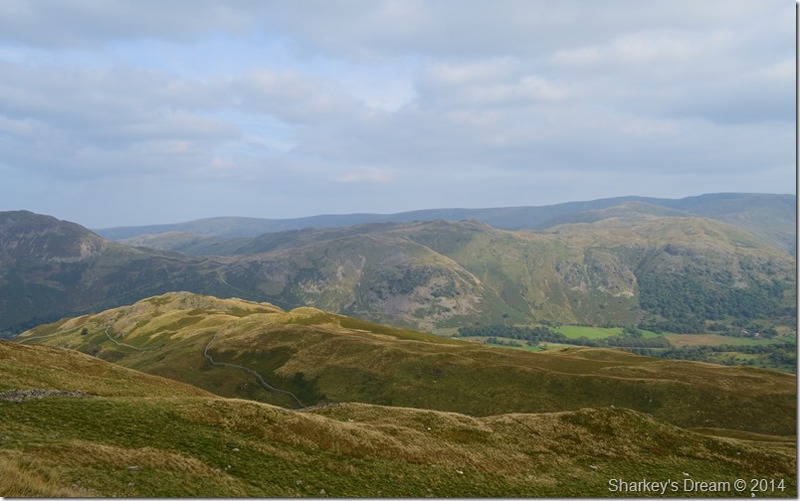 I spot four people ascending via Raise Beck/Dunmail Raise, two of which stop at the wall that continues over Seat Sandal, the other two start to make their way up in my direction. Despite having already summited Helvellyn, Nethermost Pike, High Crag & Dollywagon Pike this was the spot I prepared my head that the true walk began. 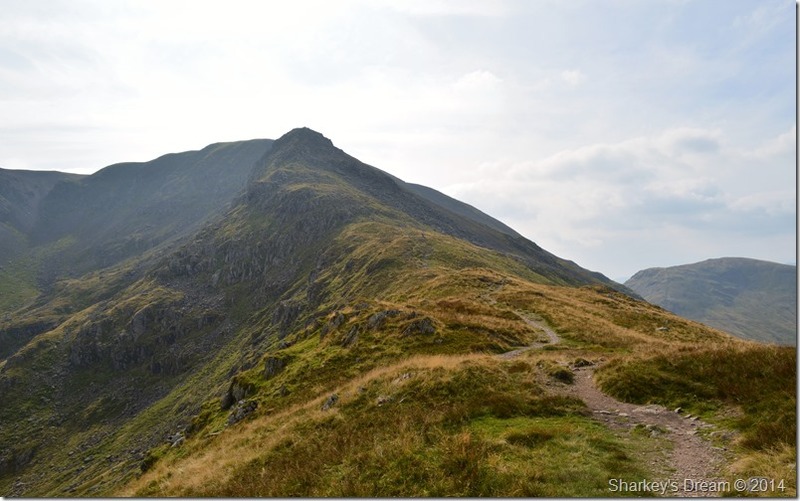 Ahead of me was a short but steep ascent to gain Seat Sandal, from which a very steep descent to Grisedale Hause then another steep ascent to gain Fairfield, if ever I didn’t want my reserves to fail me, now was that time. 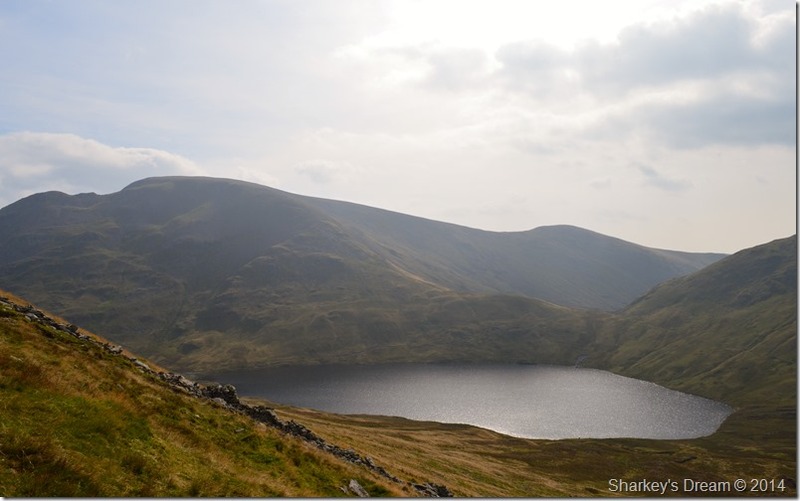 Fairfield & St Sunday Crag seen over Grisedale Tarn from the start of the steep ascent. My reserves didn’t let me down even stopping to chat with the couple who I had seen from my Dollywagon Pike descent who were climbing Seat Sandal for the first time. Fairfield & St Sunday Crag seen from Seat Sandal summit. 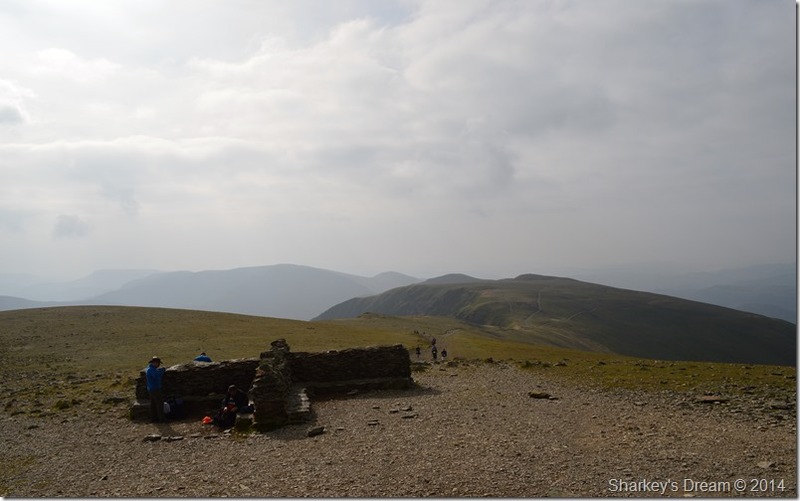 After passing the couple I soon arrived at the summit with aching thighs to boot, the summit was busy with the organised endurance walkers who largely arrived then descended. In the photo ahead is the girl I spoke with earlier who thought I was from Yorkshire who seems to have lost some team members after overhearing her conversation. 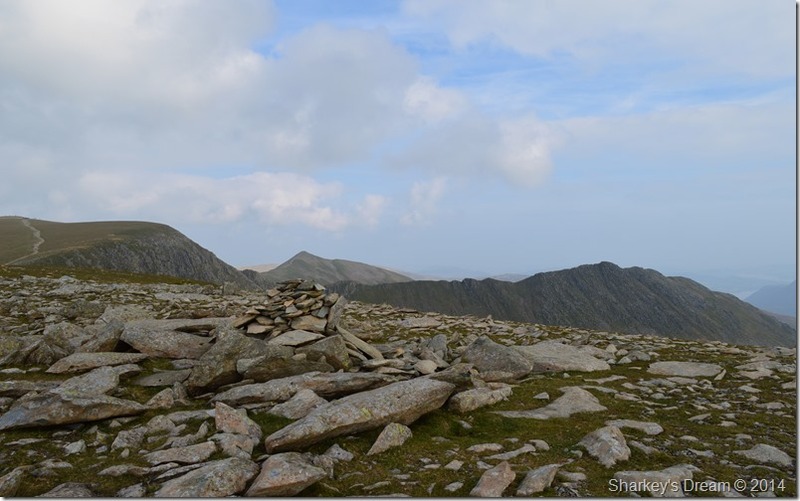 It’s now midday as I find myself a spot by the summit cairn & break open my lunch box, in there were two ham & cheese sandwiches & a bag of Malteasers, I saw no option to eat the Malteasers first through fear of them melting. 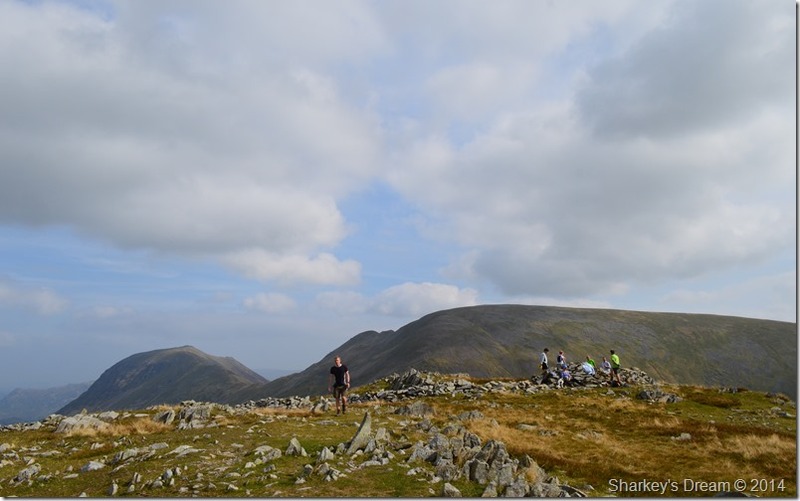 Views over Grisedale Hause towards Fairfield & St Sunday Crag. This time on the other side of Grisedale Hause now looking back on Seat Sandal. I gained my ascent of Fairfield in good stead which sadly did not last as more & more endurance walkers started to pass me which did nothing for confidence as often I would have to break momentum to let them pass, it was here my reserves started to flag a little also combined with a midday heat sapped energy levels, between here & the summit I don’t think I took my eye of my boots for the rest of the ascent. 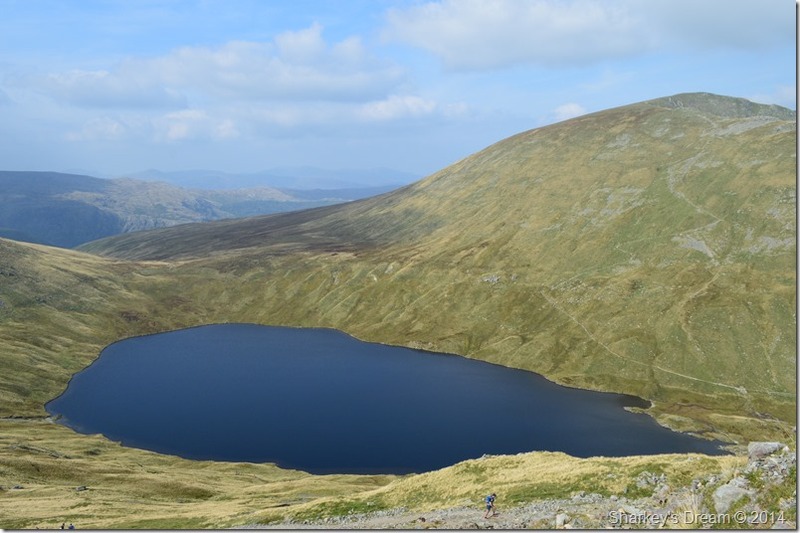 Grisedale Tarn looked pretty inviting from where I was stood! 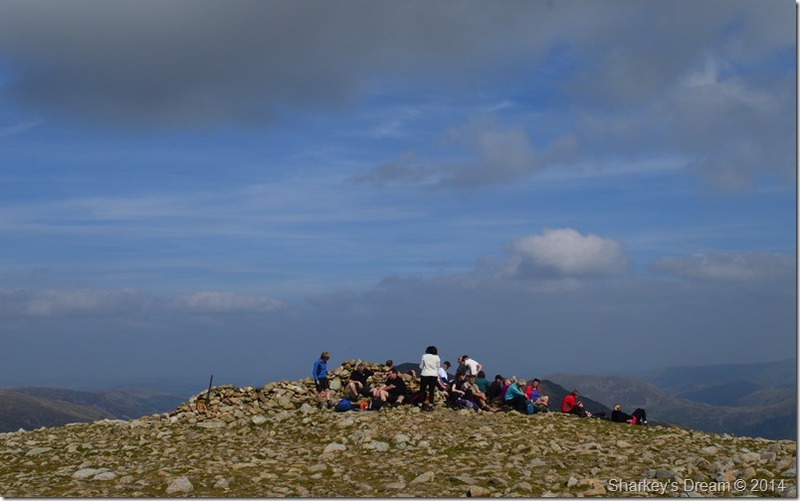 A rather crowded Fairfield summit. 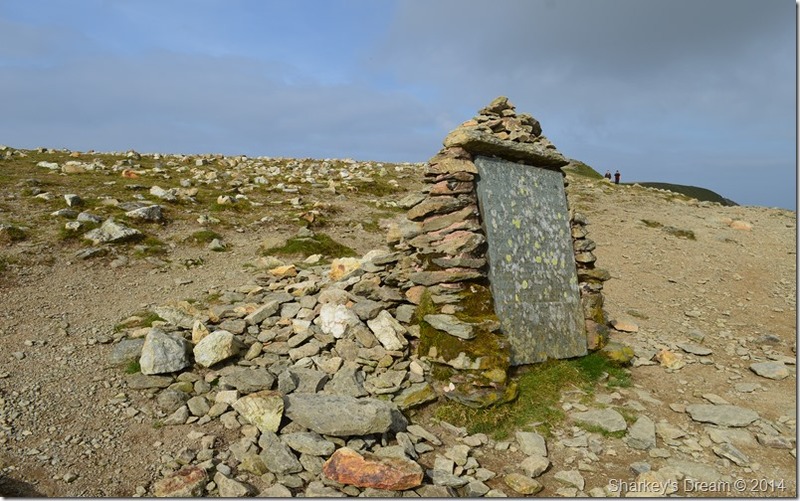 I soon found looking toward the summit cairn from the shoulder of the fell as I gazed towards the summit which was heavily crowded by fellow walkers & visitors, the stone shelter also had a gathering crowd of endurance walkers who were checking in with the Marshalls. After moments sat amongst a few scattered boulders I picked my walking poles up & followed the cairns towards my next descent over Cofa Pike. Cofa Pike & St Sunday Crag with the valley of Deepdale over towards the right. 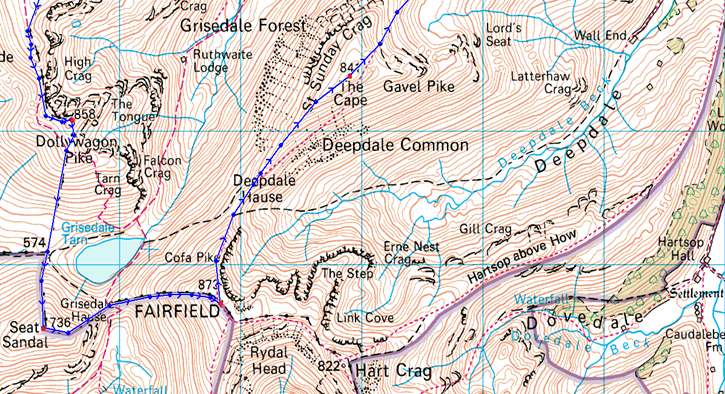 After a careful descent to the col between Fairfield & Cofa Pike I started to make the short ascent on Cofa Pike. 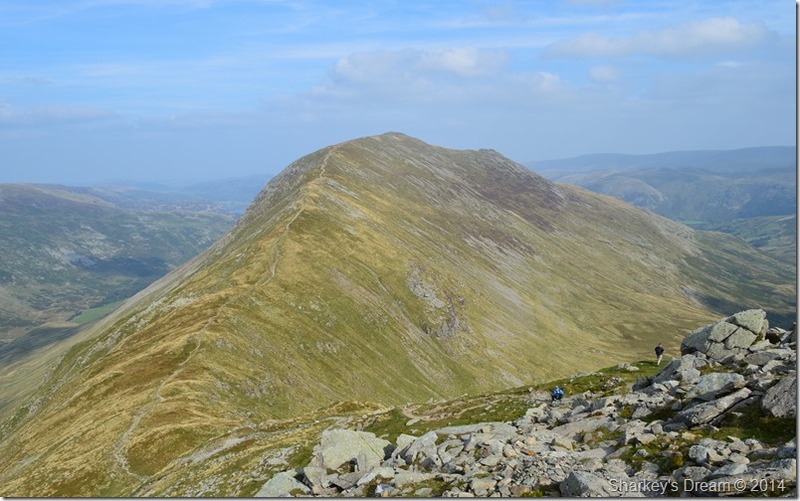 Looking back on Fairfield from Cofa Pike. From the Col I started to make the short ascent on Cofa Pike which is a wonderful summit that over looks both the Grisedale & Dovedale valleys, it was here I met a rather comical father & son who were old school Lancastrians, even myself who comes from Lancashire had a job keeping up with the ascent, as the son made his own descent he left his dad to his own devices who had the walkers making their own ascents/descents in fits of laughter with their bar gags & self mocking talent. His only fit fot kanckers yard the son would shout, he’s reet tha knows, If I weret an horse thee’d shoot me. The father & son comical combination sure lightened things up during the descent from Cofa Pike. The haze starts to lift as I enter early afternoon. 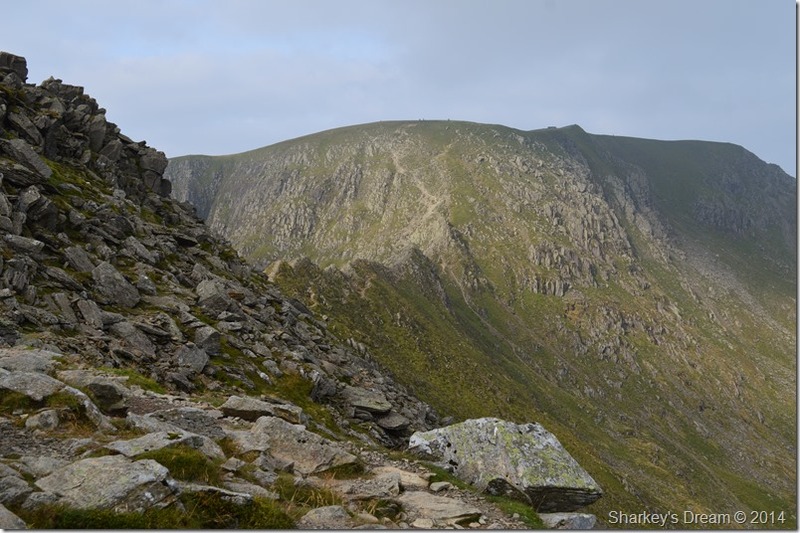 This is a classical view of the Helvellyn range seen with Nethermost Pike along with the Nethermost Pike east ridge, in the centre of the photo High Crag & to the left Dollywagon Pike can be seen with The Tongue ridge descending into the Grisedale valley. St Sunday Crag seen over Deepdale Hause. 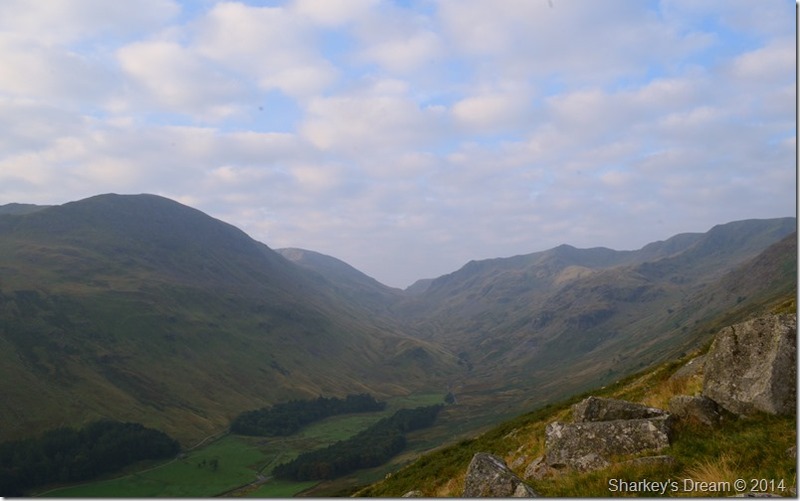 Here, looking back on Cofa Pike & Fairfield from Deepdale Hause. 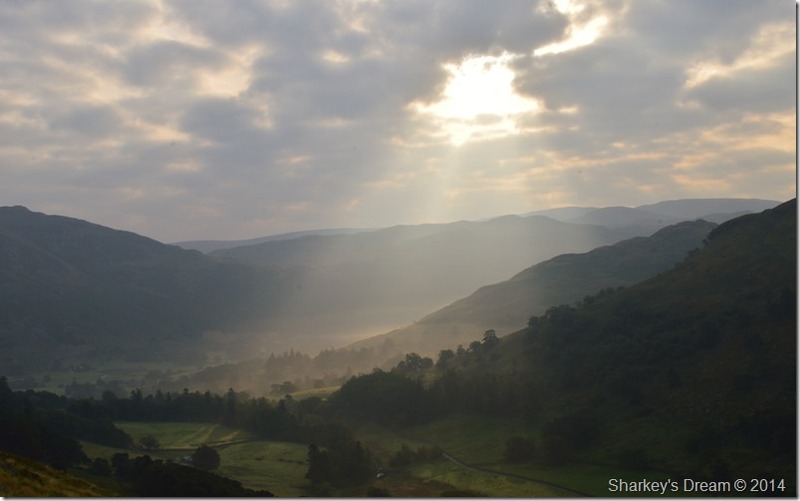 The Deepdale valley with Hartsop above How & a host of hazy far eastern fells. St Sunday Crag summit with Fairfield in the distance. During the last push towards the summit I got talking to a couple from Cockermouth who had with them a Collie named Guinness (very fitting & a great name for a black & white dog) We spoke of our routes & the days events before passing on our good wishes for the rest of the day. Shortly afterwards I had a crack with three Scottish guys also making an ascent on St Sunday Crag from Grisedale Tarn, they joked about what would happen should Scotland go independent with the likes of armed guards at the borders & alike, one of the guys quips up, you know we’ll have to re-build Hadrian’s Wall which lies sixty miles south of the actual Scottish Border, with my most patriotic voice I reply. 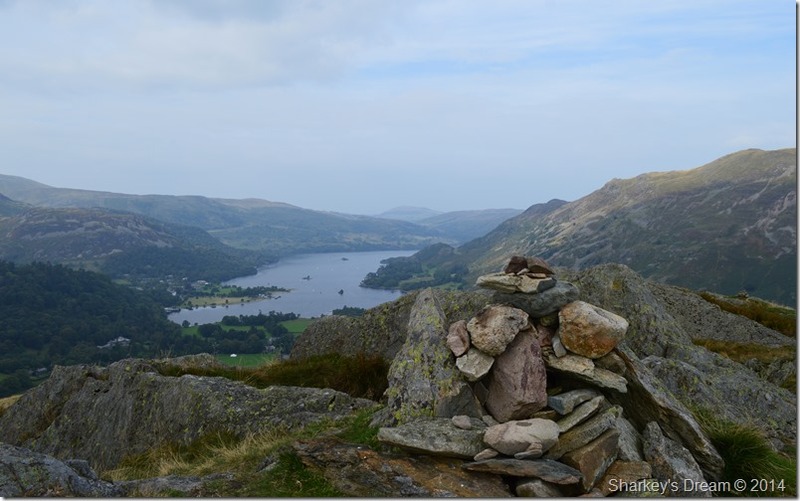 Place Fell, Ullswater & Birks seen from my St Sunday Crag descent. By now I had the rough ascents & descents behind me & to be honest the soles of my feet were starting to yearn for what only Birks could provide, the soft cushioning of grass. 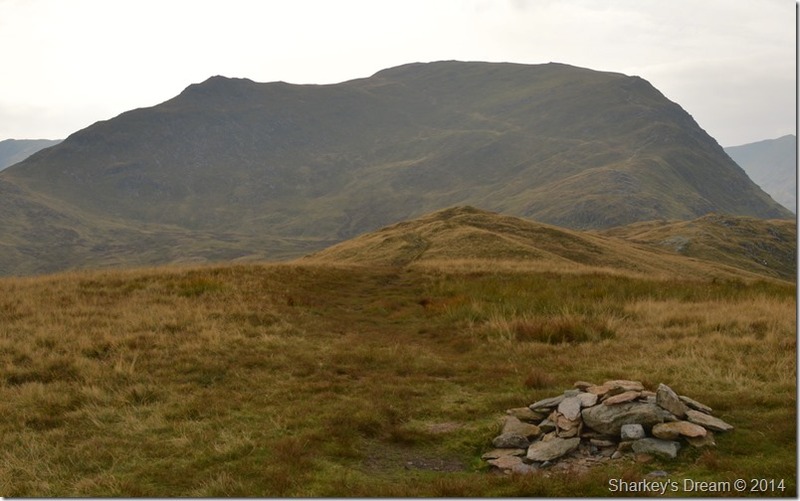 St Sunday Crag from Birks summit cairn. 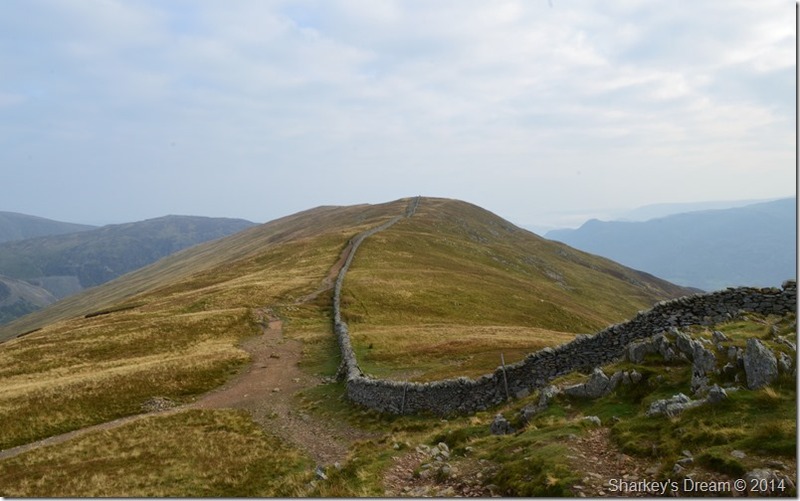 I took so much away from todays walk with a lot yet to sink in, yet when I look back the crossing from the depression between St Sunday Crag & Birks summit was a real highlight on what had already turned out to be a great day on the fells. Arnison Crag shortly after leaving the summit of Birks. After leaving the summit of Birks behind I continued for a short while before leaving the main path where two large boulders stood, this marks the point where I would descend Birks by its grassy east ridge, keeping to the wall or using it as a guide (seen far left in the photo) which would be of great advantage should the weather turn bad, I however didn’t have that problem as I picked my way down the fell forming zig zags along the way until I reached Trough Head. Place Fell & Ullswater seen over Trough Head. My descent via Birks east ridge wasn’t without it steepness which my legs although ached at, were well accustomed by the time I reached Trough Head. Arnison Crag lay north east by means of a narrow grassy path sadly out of shot in this photo. 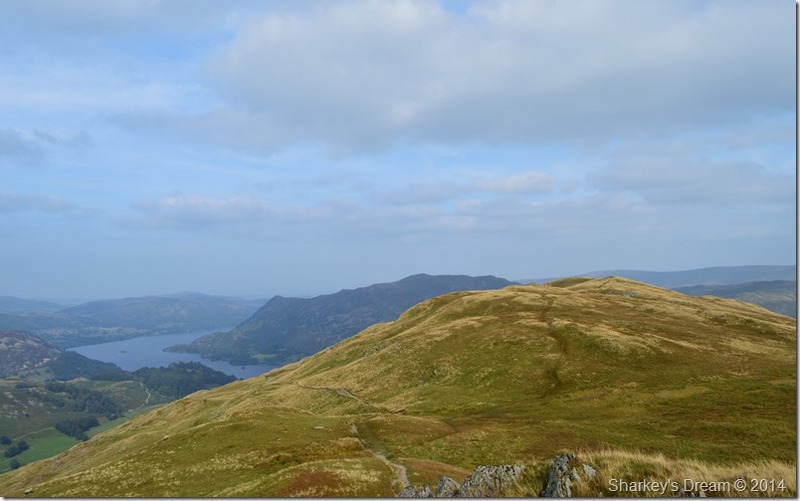 Ullswater & Place Fell from Arnison Crag summit. The last push on my last summit was met by me poking my poles hard in the ground at the same time as taking wide strides to reach the summit, by now my exposed skin had turned a toasty brown, my forehead was rough through the dried out sweat that had formed over it, my lips had that sticky goo as I had already finished the remains of my Camel Bak shortly before arriving at Birks summit. My only salvation was the last Satsuma I had which I peeled as I took in the fabulous views over Ullswater & surrounding fells. 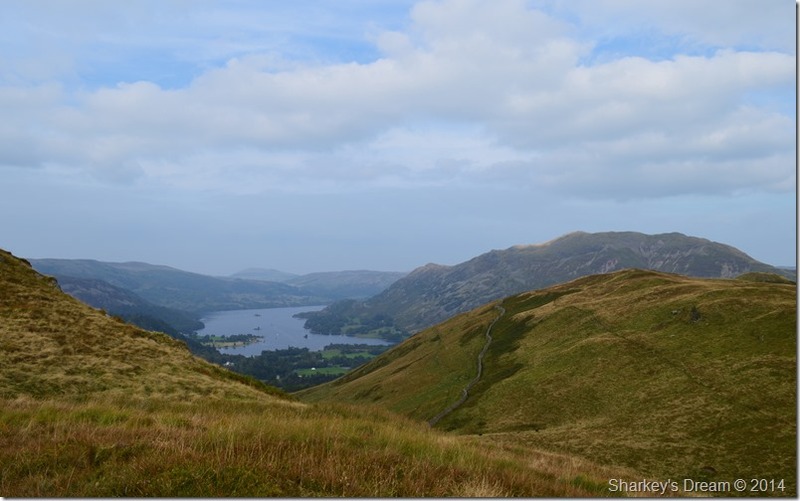 Sheffield Pike & Ullswater from my Arnison Crag descent. My descent was steep & at times rough underfoot as I made my way down via the stone wall back to the path where my walk began over eight hours earlier. Once down I curled my toes around inside my boots at the same time kicking my feet back to make the last hundred yards or so as comfortable as possible, to my left an open field where people sunbathed not even noticing myself walk by. I was getting thirsty again as I knew that my car was parked close to the Public Toilets I thought it would be a good idea to turn those taps on & drink cold water from cupped hands. It wasn’t a good idea, it was a great idea. After feeling positively refreshed I emerged from the toilets not bothering to dry my face properly -less the one sweep from my sleeve, Patterdale is alive with visitors so much so they occupy the overspill car park whilst sat at tables drinking wine & cold beers. Me, I’ve got a bottle of warm Diet Pepsi in the boot of my car & a soggy ham & cheese sandwich, I smell far worse than I probably look & my feet throb to buggery. Yet another fine day on the fells then.